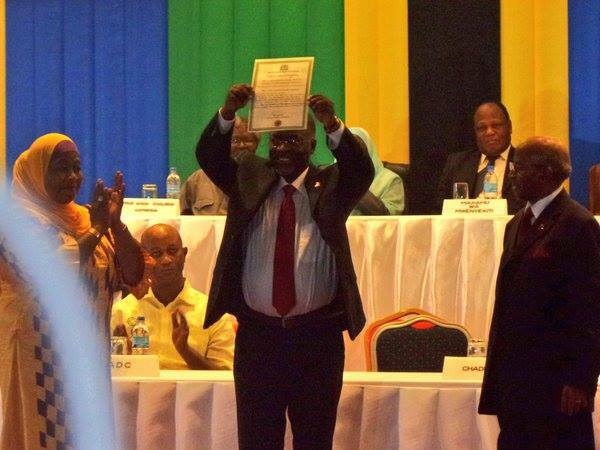 Dar es Salaam: Chairman of National Electoral Commission (NEC) Judge (rtd) Damian Lubuva on Friday presented President-elect John Pombe Magufuli with certificate of victory in a ceremony attended by various officials in Dar es Salaam. Before handing over the certificate judge Lubuva, re-read the number of votes that gave Magufuli victory and noted that the competition for the Presidency was stiff and that NEC does its job well. “As I read yesterday, Dr. Magufuli got 8,882,935 which equal 58.46 percent against Chadema’s Edward Lowassa who came second, after getting 6,072,848 votes equals to 39.97,” he said. He said 23,121,440 people registered to vote and 15,585,639 (67.31 percent) showed up to vote. 15,193,861 (97.49 percent) votes were valid. Lubuva also gave a certificate of due election to the incoming vice president, Samia Hassan Suluhu, who will become the first female to occupy the position. The ceremony was also attended by the wife of the president-elect, Janeth Magufuli, President Jakaya Kikwete, First Lady, Mama Salma Kikwete, political parties participated in election (except Chadema, chaumma and TLP). Speaking on behalf of all parties, ACT Wazalendo chairperson, Anna Mghwira said her party accepted the results and asked Dr Magufuli to oversee the transformation of the country for Tanzanians to have better lives because the country has enough resources. “Hon. Magufuli should first make sure our country gets a new constitution which has public views and other things will follow,” he said. Mghwira said she believes the new government will ensure gender equality, government unity and proper management of economy for Tanzanians to see the real change which were promised during campaigns. Magufuli will swear-in on the coming Wednesday in a ceremony at the Uhuru Stadium after completing other official procedures.